The picture I posted two days ago came from Wal Mart. Yes, I shop at the evil empire - have you seen their low, low prices? I walked in the front doors and was greeted by this cardboard sign advertising Black History Month. And, I wonder if anybody is as pissed off by the sign as I am. In the last year, I've seen retail stores begin advertising Christmas in June, Halloween in August, Thanksgiving in September, and Valentine's Day last December. We're pushing holidays earlier and earlier, and I think it's not going to stop until retail is as bad as the current political climate - constantly pushing all holidays all the time, despite how far away it is. But this... I'm all for celebrating black history month, and I don't mind businesses and other establishments encouraging the populace to embrace diversity and such, but what is this sign saying? Is it saying, "Hey, we should look back at the great things black men and women have done for humanity and use that to better overcome racial tensions and stereotypes."? 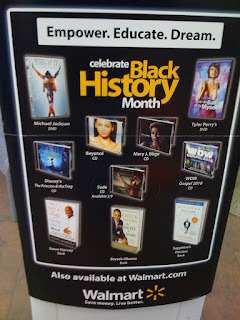 Or does it say, "Hey, black history month is coming up, you should celebrate it by buying stuff from black people."? I go with the latter. To me, this sign is subtly pushing a racist ideology that's sprung up in the last few decades. This sign focuses on the color of the author's, singer's, and movie maker's skin color rather than whether they are actually contributing to real history. I'm a fan of Beyonce, but how is me buying a cd from her 'celebrating black history month?' No, really, I'd like to know how. To expand the point a bit, how is buying anything ever a way to celebrate anything? Will the idea of Valentine's Day disappear if you don't indulge in the commercialization of the day? What about Halloween, Earth Day, or New Year's Eve? Do those days not happen or become, somehow, less if we don't buy products manufactures specifically for those days? To digress, I'd rather Wal Mart just post up a sign of Tubman, Douglas, Parks, Obama, or any one of the hundreds of black men and women who have contributed to our American way of life in a positive, real way. It's not like they need the money, and it's not like any of those products wouldn't sell without Wal Mart reminding us that the people making them are black. Celebrate the historical reminders and social encouragements that the month could bring. But, don't use it as any excuse to buy stuff just because someone is black. You shouldn't do anything for or against someone based solely on their race. It's preposterous and defeats the whole notion of equality. Share your thoughts on commercializing Black History Month by leaving a comment or emailing IncitingARiotPodcast@gmail.com. PS My article Hip Hop Rosaries and What Not to Wear is number one on Witch Vox this week! Also, next week they'll be publishing The Burning of Margaret Murray. I encourage you to check it out tomorrow! Perhaps the people of Wal-Mart (as well as average white America) think supporting black artists will help everyone to feel a little less guilty. Nice try, Wal-Mart. You hit the nail on the head. There will continue to be racism as long as we let others separate us under the guise of being non-racist. "What's profitable is promoted." It's almost a business mantra and right now the people of the hour are being outshined by entertainers who do minimal work for the any community rather than those who deserve such credit. 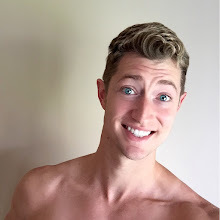 My boyfriend is white...I asked him to name 3 famous black people other than Martin Luther King, Malcolm X, and Rosa Parks. He failed miserably.